THE CROCS HAVE LANDED: Sarawak’s Super League team led by coach Robert Alberts arrived in Miri yesterday. They were welcomed by members of Miri Big Bikers Club. The Crocs will play a friendly match with a Miri Selection at Miri Stadium at 3pm on Friday. Admission to the match is free. 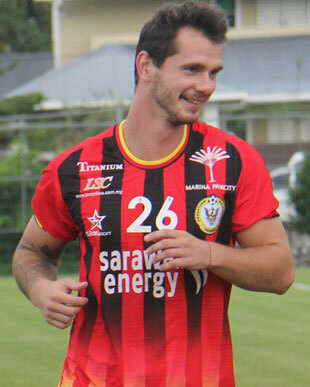 KUCHING: Montenegro player Ivan Fatic will play for Sarawak in the new Malaysia League season after reaching an agreement with Football Association of Sarawak (FAS). In announcing this during a training session at Padang D, Sarawak Stadium on Wednesday, head coach Robert Alberts said Fatic had impressed during the selection trial two weeks ago. “We welcome Fatic to the squad and I believe he will be an important asset to the Sarawak squad,” he said. “The wide experience he has in playing in the Italian Serie A and other leagues in Europe will strengthen the Sarawak squad in its bid for glory,” added Alberts. Ivan, 26, is expected to fill up the defensive midfielder position that was left vacant by Junior Eldstal who had left Sarawak for Johor Darul Takzim. In a related development, Alberts is optimistic about Billy Mehmet’s ability to help Sarawak pose a strong challenge in the new season. The 30-year-old striker from Peckham, London started training with the Crocs on Wednesday afternoon. “Billy has a good reputation not only in Malaysia but also outside the country. “We have long wanted to bring him to Sarawak and we are quite excited that he has agreed to join us,” said Alberts who added that the partnership of Mehmet and Ryan Griffiths would be exciting to watch in the coming season. The Crocs flew to Miri yesterday to undergo a training camp there and will play a friendly game with a Miri selection today. After that, they will play against Sabah on Sunday before taking on a Limbang selection on Dec 2 in the series of friendlies.